The most powerful figures in Myanmar's transition following its historic elections are to meet this week in separate talks that could set the course for the incoming government dominated by Aung San Suu Kyi's National League for Democracy. In a post on the presidential office Facebook page, Myanmar president Thein Sein confirmed he had extended an invitation to meet Ms Suu Kyi on Wednesday morning at the president's house in Naypyidaw. "The president will meet with Daw Suu on December 2nd," presidential spokesperson Zaw Htay said, without elaborating. Win Htein, a senior member of the National League for Democracy (NLD), confirmed the talks with the president. The chief of Myanmar's defence forces, Min Aung Hliang, has also confirmed he has agreed to meet the head of the victorious NLD later that day, according to ABC Radio Australia's Burmese service. Ms Suu Kyi has sought to take a conciliatory approach following the elections, dampening victory celebrations and requesting talks with the president and the army chief in the weeks following the NLD's overwhelming win in the November 8 poll. She met with parliamentary speaker Shwe Mann, whose eagerness to work with Ms Suu Kyi made him enemies among the military elite leading into the election, on November 19. Shwe Mann had at one point been tipped as a potential compromise candidate for president, but he was recently ousted from the leadership of the army-backed incumbent Union Solidarity and Development Party. He continues to wield influence as speaker of the combined national parliament and could still emerge as a bridge between the NLD and the military. Thein Sein, whose quasi-civilian government has opened the nation to the world since taking power in 2011, has said the elections were the result of his sweeping reforms and vowed a smooth transition of power. The army, which retains a quarter of parliamentary seats and other political and economic privileges, has also pledged to support the transition. 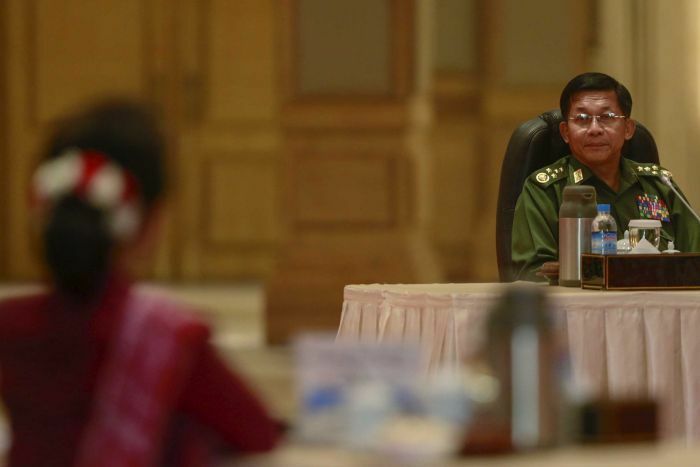 Under Myanmar's complex political system, the incumbent army-backed parliament will remain in power until at least January while a new president is unlikely to be sworn in until March. Concerns remain over Myanmar's transition in a country where the military still holds enormous political and economic sway, as well as its long history of quashing democratic aspirations. A previous election landslide by the NLD in 1990 was simply ignored by the then-ruling junta, which held onto power for a further two decades before ceding to the quasi-civilian regime in 2011. Ms Suu Kyi is still banned under the army-drafted constitution from becoming president because she married and had children with a foreigner.